Based on reviews from 321 experts and 17,279 users. 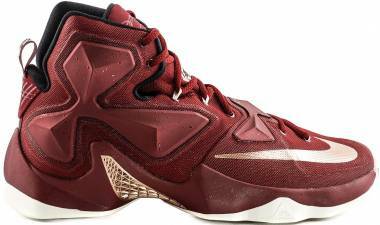 Learn how our rankings work or see our guide to red basketball shoes. Updated Apr 2019. 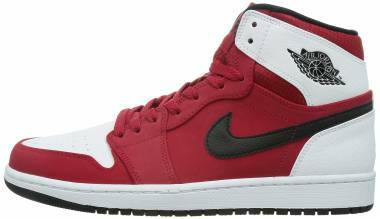 The NBA has come a long way ever since banning a particular pair of black-and-red basketball shoes Michael Jordan wore during an NBA sanctioned game. 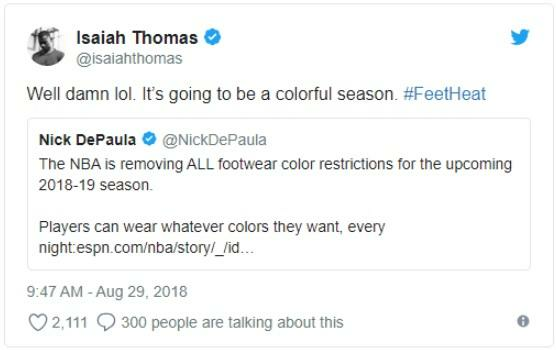 In an ongoing effort to allow players to express themselves more on the court, the league is lifting footwear color restrictions this 2018-2019 season. For the first time in the NBA’s 72-year history, players now have full freedom to wear any color footwear of their liking. Historically, the NBA has implemented a 51-percent rule. This guideline means that the majority of the footwear should be either white or black. The regulation is aimed at creating some semblance of uniformity and team unity. 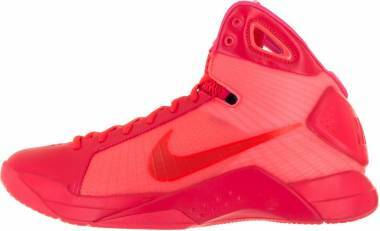 The league started to relax footwear color restrictions by the late 2000s. Players were permitted to wear shoes in their full team colors. For example, players of the Chicago Bulls can wear all red basketball shoes while the Boston Celtics can wear all green basketball shoes. In 2012, the NBA further loosened their color policy by adding event-policy games or “theme nights” to the regular season schedule. "As we saw [All-Star Weekend] take off, we started to get into what we call our event policy for footwear," NBA Senior Vice President of Identity, Outfitting, and Equipment Christopher Arena explained. "We said, 'Let's align these events with the colors of shoes.'" The league worked with sneaker companies to create storytelling shoes for holidays and other special occasions like Veterans Day, MLK Day, Black History Month, Halloween, Christmas, and Chinese New Year. Another significant change occurred in 2015 when Nike signed an 8-year apparel contract with the NBA worth approximately $1 billion. The deal took effect during the 2017-2018 season when Nike officially replaced Adidas as the NBA’s uniform provider. With nearly 67-percent of NBA players wearing Nike basketball shoes (including subsidiary Jordan Brand), the Swoosh has been aggressive in boosting the appearance of players on the hardwood. Traditional “home” and “away” jerseys were scrapped. Instead, all 30 teams were provided with “Association” (formerly “home”) and “Icon” (formerly “away”) jerseys along with “City,” “Statement,” and a few “Classic” editions for select clubs. Because of this, teams were able to designate their home and road colors. The Chicago Bulls, for example, decided to wear their iconic red for all their home games. Aside from the loosened league regulation, individual clubs can still implement their color policy. According to an ESPN report, Pat Riley once relayed to Nike representatives in 2010 that ‘all my soldiers wear the same color boots.’ This comment reportedly came about when Nike wanted LeBron James to wear bright red basketball shoes. 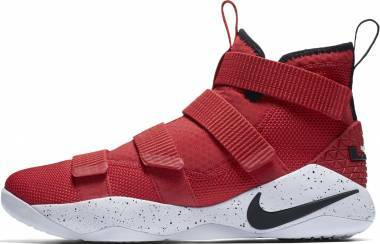 Expect a season full of color as shoe manufacturers and players ramp up their sneaker game. Right after the NBA rolled out the new Nike-designed uniforms for the 2017-2018 season, the Chicago Bulls were the first team to officially announce that they will be wearing their distinguished red jerseys for all their home games. When we picture Michael Jordan in his prime, he’s always in the Chicago Bulls’ red uniform. The reason for this is because he delivered his most memorable performances while wearing this legendary color scheme. His record-setting 63-point outburst against the Boston Celtics during the first round of the 1986 playoffs. His double-clutch dunk from the foul line during the 1988 Slam Dunk contest. “The Shot” over Craig Ehlo. The “Flu Game.” “The Shot II.” His “Last Shot.” All of these moments have one thing in common–Michael was wearing the Bulls’ red jersey. Does the color red enhance performance in sports? Another study conducted by German sports psychologists from the University of Münster found that referees are biased in favor of fighters wearing red. Psychologists Norbert Hagemann, Bernd Strauss, and Jan Leibing asked 42 experienced taekwondo referees to watch two identical videos that included 11 fight sequences. "Referees have a very strong influence in this sort of sport," Hagemann explained. The first video shows one fighter wearing a red trunk protector while the other competitor is seen wearing blue. The second video showed the same fight sequences but with the fighters’ colors switched through digital manipulation. Although the referees saw the same matches, they actually scored the fights differently (the referees were not aware of the color switch). On average, the fighter wearing red scored 13% more points than when they were sporting blue trunk protectors. "If one competitor is strong and the other weak, it won't change the outcome of the fight," Hagemann said. "But the closer the levels, the easier it is for the colour to tip the scale." What NBA teams wear red? Red is the dominant color scheme in professional sports, including the NBA. The Atlanta Hawks, Chicago Bulls, Cleveland Cavaliers, Detroit Pistons, Houston Rockets, Los Angeles Clippers, Miami Heat, and the Portland Trail Blazers all have red as their predominant team color. All of these teams are also perennial playoff contenders. 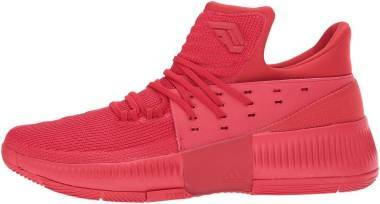 The color red attracts a lot of attention, so if you are looking to turn some heads on and off the court, then wearing cool red basketball shoes are the way to go. 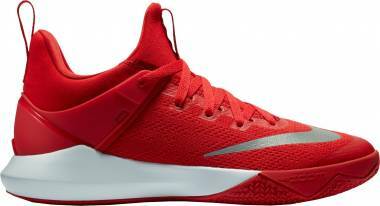 Listed below are just some of the most eye-catching all red basketball shoes from the most prominent sneaker manufacturers. Nike LeBron 15 ‘Beat Michigan’ Ohio State PE. Michigan and Ohio State’s rivalry runs deep. It is said to be one of the nation’s best, if not the greatest, rivalries in college football. 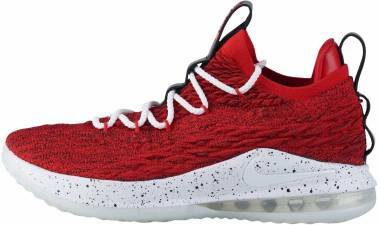 In the spirit of competition, Nike and The King LeBron James gifted the Ohio State Buckeyes Men’s Football Team with LeBron 15 PEs dubbed ‘Beat Michigan.’ These all red basketball shoes feature a bright red Battleknit upper, midsole, outsole, and laces. 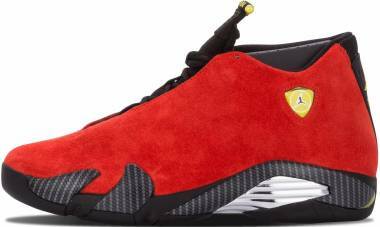 Other details include the “O” and “OH” logos embossed on the suede tongue and heel pull tabs. Nike Kyrie 4 ‘Red Carpet.’ Leading up to the release of the feature film Uncle Drew, Nike launched a Hollywood-inspired colorway of the Kyrie 4. 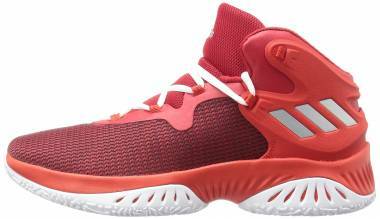 These bright red basketball shoes celebrate Irving’s debut on the big screen. 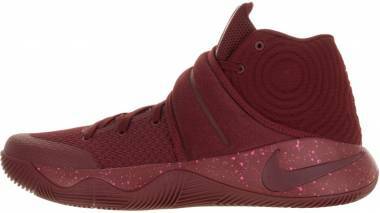 Crafted to match the glitz and glamour of Hollywood, the Nike Kyrie 4 ‘Red Carpet’ features a full-red upper with patent leather detailing and gold accents. Nike KDX ‘Red Velvet.’ Nike and Kevin Durant take a jab at his critics with the ‘Red Velvet’ colorway of the Nike KDX. According to Nike, “At the end of the day, winning is all that matters and anything else is just icing on the cake. 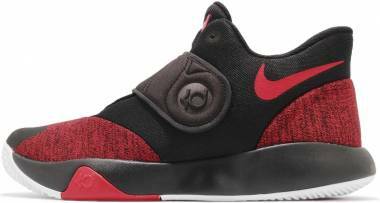 The KDX 'Red Velvet' celebrates the smoothest player in the game and his undying quest for the sweet taste of victory.” These dark red basketball shoes feature a fire-red upper sitting on top of a white dotted outsole. 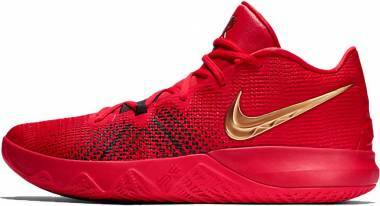 Nike Zoom Kobe 7 System Supreme ‘Year of the Dragon.’ Released in 2012, these Chinese-zodiac-themed Nike basketball shoes take inspiration from Bryant’s Italian roots and love of martial arts. 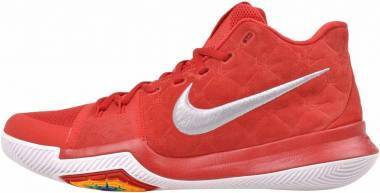 The Nike Zoom Kobe 7 System Supreme ‘Year of the Dragon’ features a mix of red, yellow, and green. 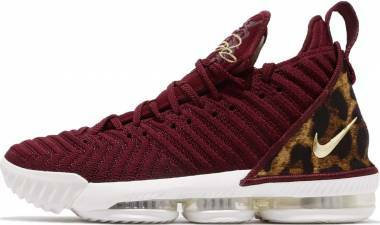 Other details include Bryant’s signature and a yellow dragon on the heel. Air Jordan 11 Retro ‘Win Like ‘96.’ After a disappointing 1994-1995 campaign, Michael Jordan and the Chicago Bulls were determined to return to their winning ways. The ‘96 Bulls would go on and recapture championship glory, posting an impressive 72-10 regular season record on the road to their fourth championship. Through it all, Michael was wearing the 11th installment of his signature Air Jordan basketball shoes. Dubbed the Air Jordan 11 ‘Win Like ‘96,’ these bright red basketball shoes boast a brilliant red-based upper with black accents. A white midsole and icy outsole complete the ‘96 Bulls-inspired theme. The word “Bellissimo” (very beautiful in English) is stitched on the tongue, and to cap everything off, a launch button (similar to the push start button seen in cars) is printed on the sockliner. Jordan CP3.XI ‘City Edition.’ Chris Paul keeps things simple with the ‘City Edition’ colorway of his Jordan CP3.XI. 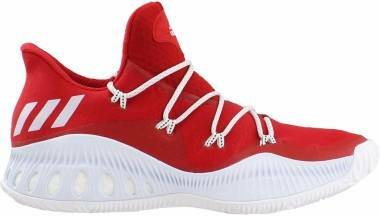 These all red basketball shoes feature Chinese characters on the strap that mirror the Houston Rockets' “City” uniform. 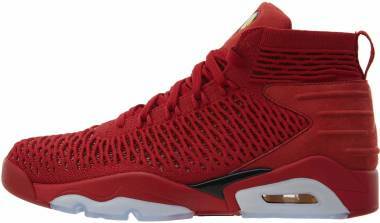 Jordan Melo M13 ‘Red October.’ Following the launch of the Nike Air Force 1 Mid ‘Red October,’ Jordan Brand also decided to release their very own Red-October-themed sneaker. 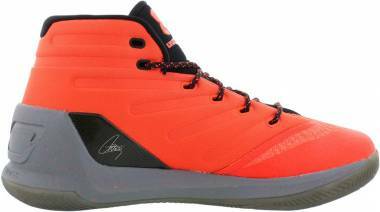 Decked out in all red, the Carmelo Anthony’s Melo M13 ‘Red October’ features rubberized synthetic overlays with contrasting mesh medial sides. 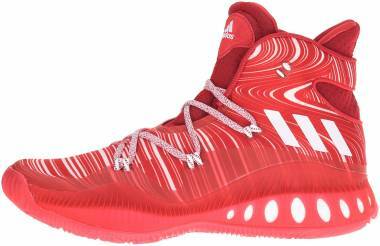 Adidas D Rose 5 Boost ‘Brenda.’ A recurring theme in Derrick Rose’s signature line, the ‘Brenda’ colorway pays tribute to his mother. 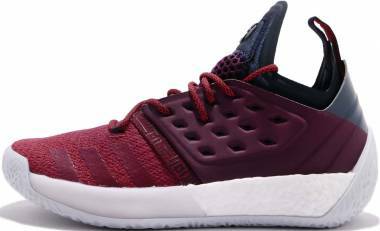 Dressed in Mama Rose’s favorite color, the Adidas D Rose 5 Boost ‘Brenda’ boasts a red woven upper decorated with D Rose logos and stars inspired by the city flag of Chicago. Providing some contrast is a grey fit cage with black speckles. 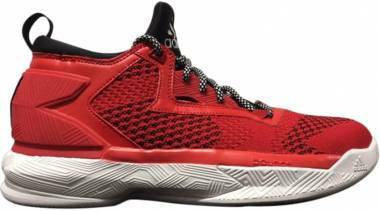 Adidas Dame 3 ‘Roots.’ The ‘Roots’ colorway is inspired by Damian Lillard’s days with the Oakland Rebels. To increase strength and instill discipline, his coach would have his players hold bricks while practicing their defensive stance. 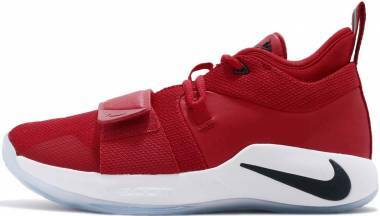 Dressed in all red, these slip-on basketball shoes are perfect for hitting the hardwood as well as the streets. 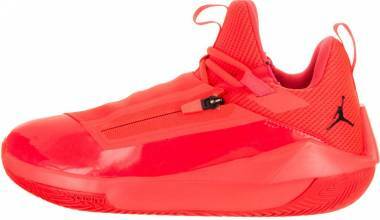 Adidas Harden Vol.1 ‘Red Glare.’ James Harden’s fiery playing style and ability to light up the scoreboard inspired these all red basketball shoes. 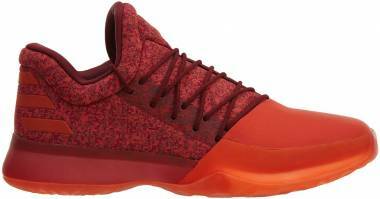 The Harden Vol.1 ‘Red Glare’ features a red knit upper with a bright red leather toe box. A darker shade of red is used on the laces and sockliner. 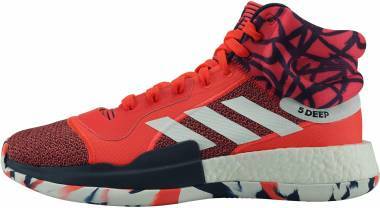 A two-toned semi-translucent outsole completes the silhouette of these low-top Adidas shoes. UA Curry 5 ‘Fired Up.’ Under Armour celebrates Stephen Curry’s third championship with a special colorway of the Curry 5. 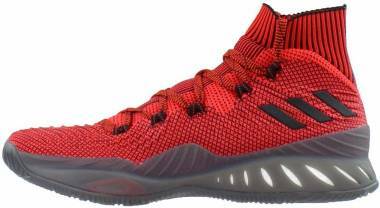 The UA Curry 5 ‘Fired Up’ features an all-red upper with hits of black on the branding. A light grey outsole completes the look of this celebratory colorway. UA Curry 4 Low ‘Nothing But Nets.’ Stephen Curry has been championing the Nothing But Nets campaign of the United Nations Foundation since 2013. In an effort to rid the world of malaria, Stephen and Under Armour launched a special edition colorway of the Curry 4 Low. 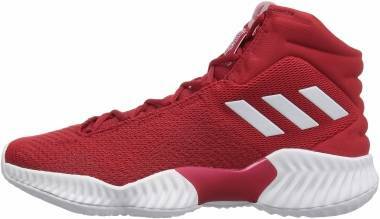 Dipped in all red, the ‘Nothing But Nets’ feature a netting design on the heel. For each pair sold, an insecticide-treated net will be donated to a family in need of protection against the life-threatening disease. "Red is the archetypal color, the first color humans mastered, fabricated, reproduced, and broke down into different shades, first in painting, later in dyeing. This has given it primacy over all other colors through the millennia." After black and white, red is the next color humans started to recognize. Every language studied around the world first had a word for the colors white and black (or light and dark). The next word for a color to come into existence is red, the color of blood and wine. After red, yellow and green appear, and lastly blue. The most primary of primary colors, red can stake its claim as the oldest and most powerful color. “For thousands of years in the West, red was the only color worthy of that name, the only true color,” Pastoureau details in his book Red: The History of a Color. From the source of life and divine love to lust and anger, the color red has represented a number of things throughout history. Let’s dive into the surprising history of the world’s most symbolic color. Scientific evidence shows that over 40,000 years ago, Paleolithic hunters and gatherers ground up ochre (a natural clay made red by the presence of iron oxide) to create paint. These archaic humans used the red pigment to paint their bodies as well as their cave dwellings with drawings of animals, vessels, and people. Stone Age graves were also found to contain this red pigment. It is believed to have been used as protection in the afterlife (to ward off evil spirits) or to possibly neutralize odors. Whatever its purpose, the color red had an important ritual significance. In Ancient Egypt, Hathor (the goddess of fertility, love, and joy) was often depicted in red. Romans and Greeks used red as a dye for hair, makeup, clothing, and painting. Red is associated with blood and courage in Roman mythology. It is the color of Mars, the god of war as well as the Roman army. Soldiers wore red tunics while generals wore a scarlet cloak. Roman gladiators were also adorned with red. Roman brides wore red shawls called a flammeum as a symbol of love and fidelity. Roman and Pompeian houses were decorated with rich cinnabar fresco to communicate luxury. However, this came at a price. The miners (who were usually slaves or prisoners) who were tasked to extract cinnabar (a mineral consisting of highly-toxic mercury) were practically given death sentences. The color red was used on inscriptions and medieval manuscripts to allow people to read the lettering. Specialized scribes called rubricators used red ink to highlight essential portions and chapters for emphasis. The term “red letter day” is rooted in the Roman calendar. Important dates such as festivals and celebrations were presented in red. Crimson flowers were used in Rome for funerals as a reminder of how short life is. From late antiquity to the Middle Ages, the use of red proliferated. Kings used red to show their God-given right to rule. It became the color of royalty, signifying power, majesty, and authority. Charlemagne wore red shoes at his coronation and had his palace painted red. He was also reported to have red hair. Louis XIV of France is seen dressed in red in his official portraits. Judges often dressed in red in the Middle Ages as a symbol of their delegated power and function - to assert the law and render judgment in lieu of a king, prince, state or city. In Christianity and Christian iconography, the color red is symbolic of the holy blood of Jesus Christ. Red is also used to symbolize the sacrifice of Christian martyrs. Because of this, Catholic cardinals wear red robes, and the color red is dominant in public-worship garments. During the Crusades, Crusaders carried a white flag with a red cross that symbolizes the holy blood of Christ as well as the blood the soldiers were willing to shed to free the Holy Lands. In Chinese philosophy and culture, red is associated with the five elements: yellow for earth, black for water, green for wood, white for metal, and red for fire. Red or the fire element is related to dynamism, confidence, leadership, aggression, and hypersensitivity. Chinese Emperors were advised by their fortune tellers that the color red would bring good fortune and the most prosperity to their reign. In fact, red was the royal color of the Chou (Zhou), Han, Jin, Song, and Ming dynasties, and was heavily featured in royal ceremonies. In one particular Tang-era painting, 11 of the 13 Chinese Emperors from the Han to Sui dynasties are depicted in red robes to symbolize their royal power. Traditionally, Chinese brides wear red wedding gowns and are brought to the ceremony in a red litter. The brides also walk down a red carpet. Because red is associated with good fortune and joy, it is banned from Chinese funerals. Brides in Greece, Armenia, and Albania still wear red veils. Arab alchemists mixed sulfur with mercury and created a new hue called vermilion. Vermilion was perfected by the Chinese and was further developed by alchemists in the Islamic Eastern Mediterranean. Vermilion arrived in Western Europe between the eighth and eleventh centuries. Spain’s conquest of Mexico in the 1500s allowed for the proliferation of the color red in Europe. While in Mexico, the Spaniards discovered textiles dyed in striking red. The substances (madder and kermes) used to create red dye in Europe produced a weaker, browner hue. The secret of the Aztecs was cochineal, a small beetle that was scraped off cactuses, dried, and then crushed. After the discovery of cochineal, the Spaniards established a vast trading system to export the bug to Europe. A portrait of Princess Elizabeth I before she became Queen shows a young woman in a richly decorated red dress with a red coif (close-fitting cap). Her attire sends an undeniable message of her political and moral strength. French revolutionaries wore red caps (phrygian cap) and carried red flags during the French revolution to symbolize new liberties and freedoms. After the French Monarchy fell, red became the color of the worker’s movement and was used by revolutionaries around the world. From the Bolshevik, Cultural, Russian, Cuban, Vietnam and more, red became the outright color of revolutionaries by the 20th century. From the happiest feelings to the worst, red can mean a lot of things. It is a color that evokes the strongest reaction. Let’s take a look at some of red’s positive and negative traits. Crimson. This shade of red has a little blue in it and is inclining to purple. Crimson shows a drive to succeed without stepping on anyone. Scarlet. This shade of the color red has a tinge of orange in it, providing it with richness and brightness. 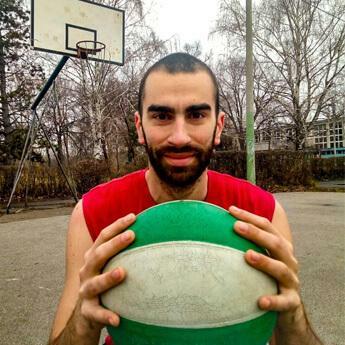 It is more fun-loving than real red, indicating enthusiasm and a love for life. Maroon. A dark brownish red that represents controlled and thoughtful action. Burgundy. A darker more purplish shade of red. More sophisticated than true red, burgundy signifies controlled power, dignified action, and determined ambition. In Russian, the word for red has the same root as beautiful. Red is the longest wavelength of light. It is the highest arc of a rainbow. Bees can see all other bright colors except for red. Because of this, red flowers are usually pollinated by butterflies, birds, bats, and the wind. According to Feng Shui, painting the front door red invites prosperity. Red represents the United States Republican Party. Red fruits are flavorful and nutritious. The red stripes seen on the U.S. flag stands for courage. Bulls are color blind, so the color red doesn’t make them angry.